The Scoped Revolver enters the game as a longer distance option for the pistol weapon class. Our Fortnite Scoped Revolver Guides runs you through where-to find and how-to use this interesting new addition to your arsenal. We also go over damage and stats so you'll best know when to use this new weapon, and we have tips and tricks so you can take advantage of any hidden ways to slay your enemies. Pistols are actually in a pretty decent spot right now. While the regular pistol is still pretty poor, the suppressed pistol is still a solid weapon in the right hands. Also, the hand cannon has found a place in a lot of loadouts now that it can be used to destroy structures efficiently and pop heads at a longer distance. It's a bit surprising to see a pistol being added to the game due to the recent unvaulting of the dual pistols. 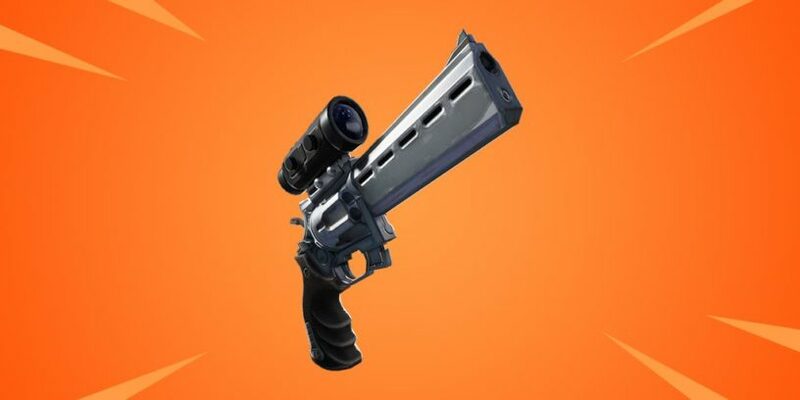 The Scoped Revolver was released on Tuesday, January 15th 2019. The Scoped Revolver comes in both Epic and Legendary variants. It fires Medium ammo and does 42/44 damage per shot to the body. Headshots do 84 and 88 damage, so you won't be one shotting anyone in the early game. You'll be able to find these from floor loot, chests, supply drops, and vending machines. This weapon is going to be best used at mid-to-long range. It's very accurate, so you can use it for distance shots but it's just flat out not going to be better than a sniper in long range situations. I'm not sure if this is good enough to replace the smg, hand cannon, or the sniper rifle. It will be jockeying for those spots, and there's very few scenarios where this is the better option than most of those weapons. This thing isn't doing a ton more damage than an assault rifle and is far less versatile.